I had some free time today so I decided to get back into baking while the weather was still cool. 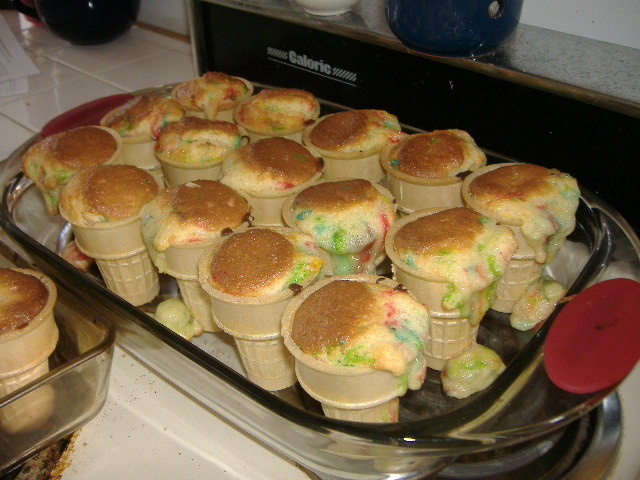 I really like making cupcakes, and I always wanted to try them in ice cream cones. These turned out to be pretty cute. I was too lazy to make the batter from scratch, so I used Pillsbury’s confetti cake mix. 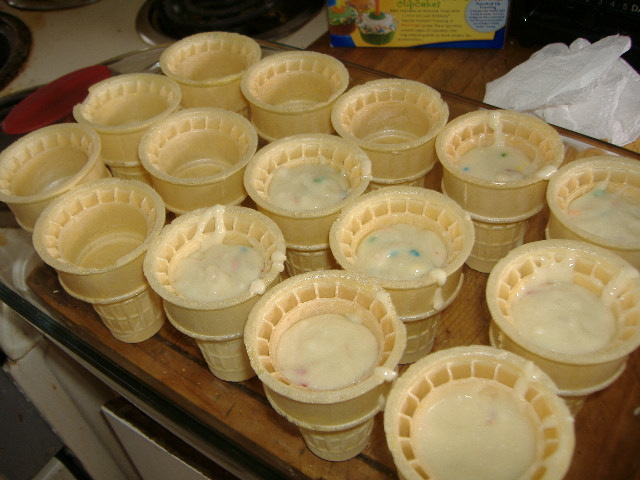 I got 24 flat-bottomed ice cream cones and filled them, leaving about a half to three-quarters of an inch from the top. I then baked them according to the directions on the box. Some of them overflowed a little bit, so I tried to clean them up the best I could. 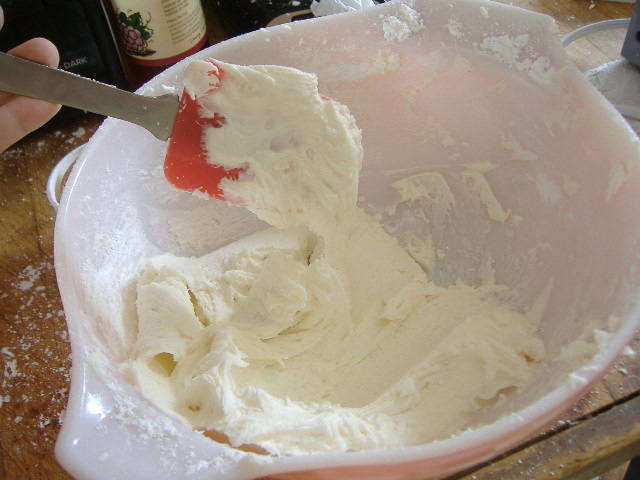 Using a mixer, combine the first four ingredients. I find it easier to mix a cup of the sugar at a time, with a tablespoon or so of the liquid. 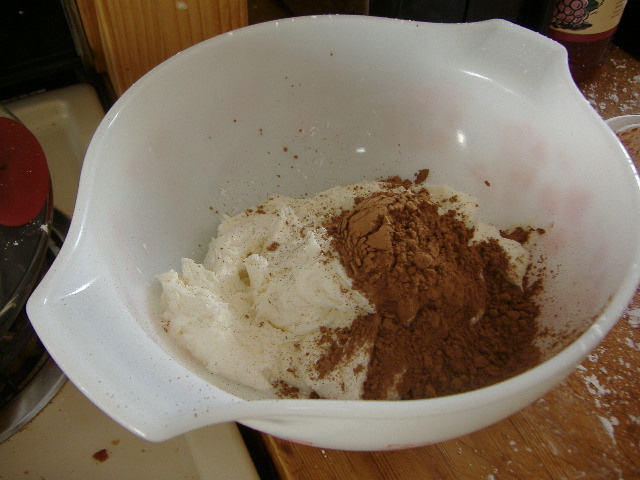 Divide the frosting in half, and then mix the cocoa powder into one half. You now have both chocolate and vanilla frosting. 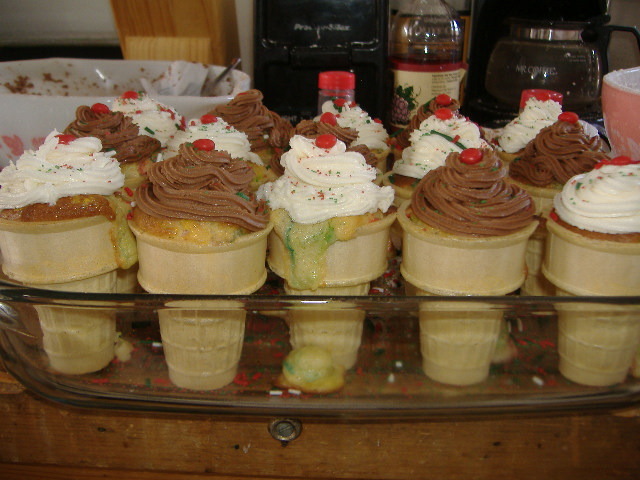 I then piped the frosting on the tops of the ice cream cones using a star tip. I only had a small one, but I would recommend using a large one, both for ease and a more ‘ice-creamy’ look to the frosting. I then decorated the frosting with sprinkles and cinnamon dots for cherries. As you can see, my sprinkles were left over from Christmas cookies, hence the red and green. Voila! You have cute cupcakes!